We offer a unique way for you to advertise your tyre fitting business through our range of custom tyre valves. 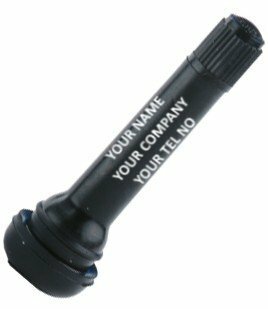 Our unique technique for customising the tyre valve stem with your choice of text will help to remind your customers where to call when they need their tyre repaired or replaced. What is different about our Custom Tyre Valves? We are small business dedicated to supplying tyre fitters around the UK and Europe the most useful Tyre Valves for your business. These customised items offer you a unique offering to your customer, and a repeat business opportunity in the future also. If you have a special request for your tyre valve customisation please call our team today on 01527 883 580, and we will work with you to create the valve you need with the design you want.